Who won the 138th edition of US Open under Women’s category? It was 138 edition of US Open and the last Grand Slam of the year. French Open tournament was held earlier this year, who was the winner of Men’s Title? Who stood as runner-up in French Open 2018? Wimbledon 2018 winner in Men’s Category? Australian Open winner 2018 in men’s category? Who was the runner-up in 2018 Australian Open under women’s category? Miami Open 2018 winner under women’s category is? Barcelona Open Tennis title winner for 2018 is? Monte Carlo Masters tennis tournament has been won by? The runner-up player in Rotterdam Open title was? Basel Open 2018 title was won by? Who is winner for Taipei OEC Open title in doubles category? Recently which cricketer became 2nd fastest to score 25 Test centuries leaving himself just behind Sir Don Bradman. The new name of IPL team Delhi Daredevils for Indian Premiere League 2019 is? Which country hosted 2018 women’s cricket world cup? Blind Cricket world cup 2018 final was held at which place? 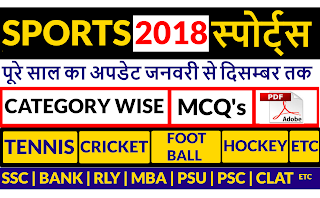 Who won 57th edition of Duleep Trophy 2018? India won most number of times - 7 TIMES. Which Indian cricketer has become a brand ambassador of gaming platform DREAM –II? Which bowler set record for fastest 100 ODI wickets? Fastest 50 for India in women’s T-20 Cricket by? First ever Indian women player to play Kia super league in England? 2018 Women’s Twenty -20 Asia Cup was organized at which place? Cricket curry festival organized in which country? The 5th Indian to be inducted in ICC Hall of Fame is? The only cricketer to hit 4 hundreds in T-20 International Cricket 2018 is? Vijay Hazare Trophy 2018 winner is? The only women player to take 300+ international wickets is? First ever Indian to win gold in BWF World Tour Title? Who among the following stood runner-up in Denmark Open 2018 ? World Badminton championship winner in women’s single is? Winner of Russia open badminton trophy? Winner of India Open 2018 championship is? Winner of Japan Open 2018 in women’s category is? Winner : kento Momota (Japan). Runner up : Khosit Phetpradab, Thailand. Which player won gold medal in Syed Modi International championship? Iceland and Panama Qualified for the first time in 2018 World Cup. Brazil is the only nation to play all world cups and they won five titles. Santosh Trophy 2018 was organized in Salt lake stadium, Kolkata. Which team emerged as champion? The venue for FIFA World Cup - senior women 2019 is? What was the mascot of 2018 FIFA World Cup? Who among the following won this year's Ballon d'Or award? The 24th Senior Women’s National football championship has been won by? Luka Modric of Real Madrid and Croatia was awarded the UEFA Player of the Year (2017-2018). He helped Real Madrid won the Champions League for a third season running and then led Croatia to the World Cup final. Which country won FIFA U-20 Women’s title held in France 2018? 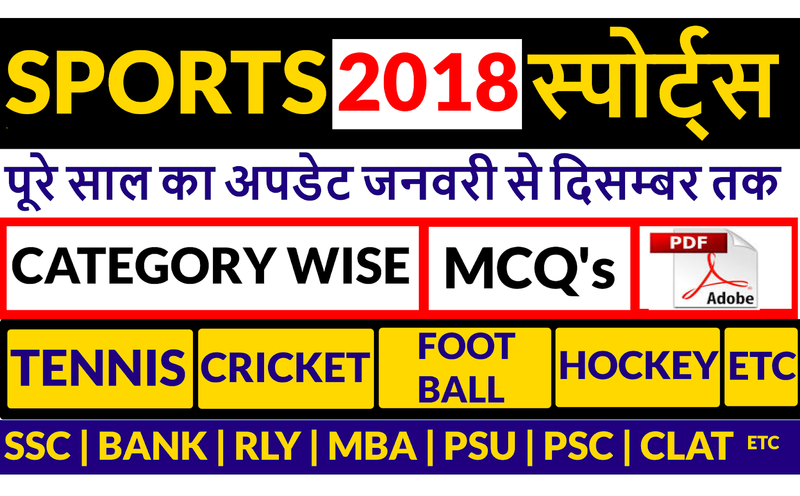 Where is sports Current affairs pdf? 28 December already gone ..